Yellow Springs’ Elly Kumbusky (21) slides into home plate as Cedarville pitcher Jade Hovan tries to take the throw from catcher Kerrin Snyder in the first inning of Wednesday’s April 11 high school softball game in Cedarville. Kumbusky was safe on the play, but Cedarville won 18-3. Third baseman Brielle Willis of Yellow Springs tags out Cedarville base runner Madelyn Church in the bottom of the first inning, April 11 at Cedarville High School. 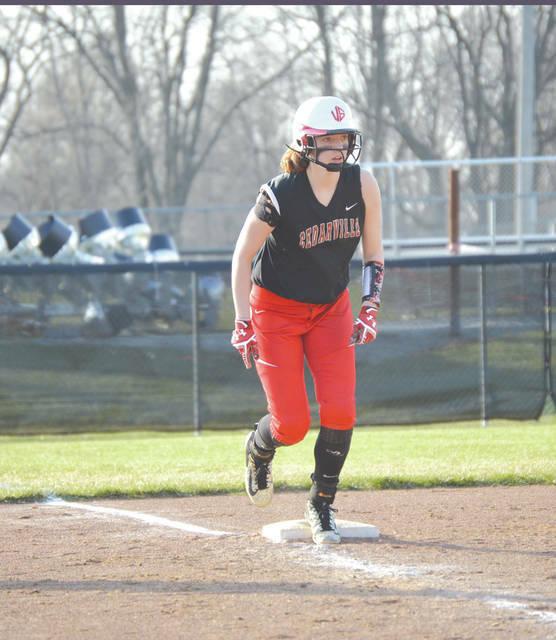 Cedarville first baseman Kaylee Cyphers clouted two doubles and a triple to go 3-for-3 at the plate, driving in three runs and scoring two others in the Indians 18-3 run-ruled win Wednesday April 11 over Yellow Springs. 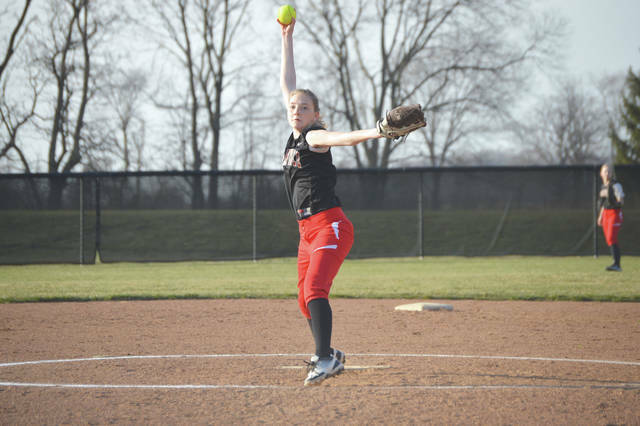 Cedarville pitcher Jade Hovan limited Yellow Springs to four hits, while striking out eight and walking four to get Wednesday’s run-ruled win at Cedarville High. CEDARVILLE — It took a little patience for the Cedarville bats to come alive, but when they did …. woah! 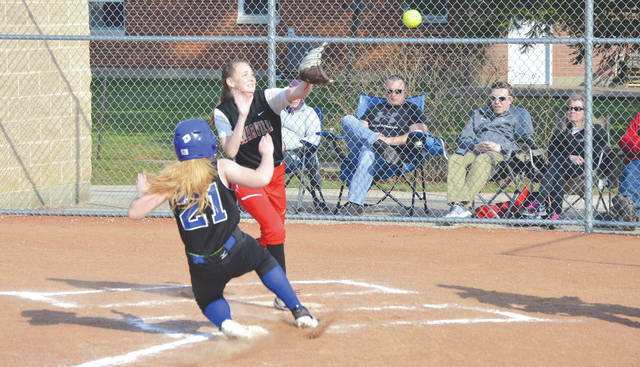 Cedarville rallied twice in claiming an eventual 18-3 run-ruled victory over visiting Yellow Springs, April 11 in girls high school baseball. Indians coach Katie Perry explained that her team is still adjusting to not having returning starters Grace Jacobs and Lauren Whitaker in the lineup, two talented players who are currently out with injuries. The visiting Bulldogs surprised Cedarville by jumping out to a quick 2-0 lead in the first inning. Yellow Springs’ Kadie Lafferty and Elly Kumbusky both singled to start the game. Lafferty came home with the game’s first run on Kumbusky’s hit to left field. Then Kumbusky scored on a wild pitch. Cedarville took advantage of four walks in its half of the first inning, with Sami Buettell scoring the Indians’ first run on a wild pitch. The Indians then tied the game in the second when Kemmeron Horsley scored from third on Jade Hovan’s infield groundout. But the youthful Bulldogs grabbed the lead once again in the top of the third inning. Gracie Price singled to center to get on base with one out. She then swiped second base without a throw, stole third and charged home on a wild pitch. Then Cedarville’s bats came alive. Nineteen Indians batters went to the plate in the third inning as Cedarville scored 15 runs on eight hits. Five batters got on base by drawing walks, two others were hit by pitches and one more reached on an infield error. First baseman Kaylee Cyphers bashed two doubles in the third inning alone, driving in three of the runs and scoring twice. Cyphers later hit a triple in the fourth. Second baseman Regan Caffey went 2-for-2 with a walk and four RBI, two stolen bases and a run scored, and leadoff hitter/starting pitcher Jade Hovan also went 2-for-2, but she had a pair of walks, three unchallenged stolen bases, two RBI and two runs scored. 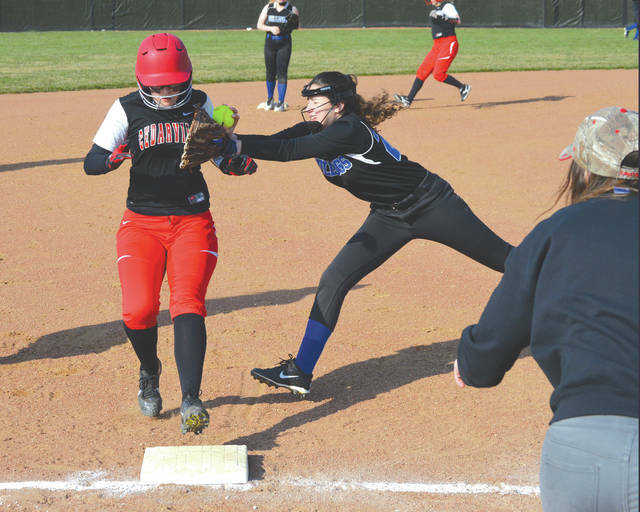 The win is the first of the season for Cedarville (1-4), who will get back into Ohio Heritage Conference play Thursday, April 12 when they take on Greeneview at home. The Yellow Springs loss was just the team’s second in two games played thus far this season. Bulldogs coach Jim DeLong remains optimistic about his team’s future. Yellow Springs is also back in action on Thursday. They head into Dayton for a non-conference game with Belmont.